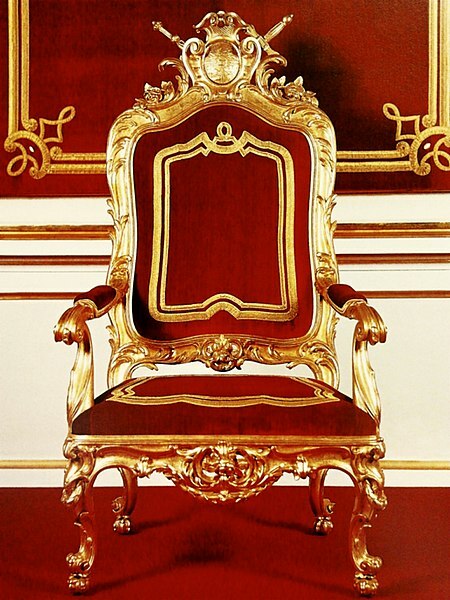 Throne of King Stanislaus Augustus of Poland, 1764. The truth is, Mark’s Gospel often casts the disciples in an unfavorable light. They are slow to grasp Jesus’ identity and message. They seek glory for themselves. They seem congenitally unable to come to terms with the fact that Jesus is not going to be the kind of Messiah they have long awaited. Our passage from Mark 10 begins with the last of three predictions of his death that Jesus makes on his way toward Jerusalem. (The first two can be found at 8:31 and 9:31). As with the first two predictions, this one results in an impromptu lesson on the nature of discipleship. And once again, this lesson arises out of a fundamental misunderstanding on the part of the disciples. The sons of Zebedee dream of becoming great in Jesus’ kingdom. With incredible nerve—and an utter inability to grasp what their Lord has been telling them—they submit their requests for the seats of highest honor. Jesus informs them, though, that true greatness doesn’t involve thrones or other tokens of prestige. Rather, it involves humble acts of service and self-sacrifice. Jesus’ words in this passage are familiar to most Christians. If we’re not careful, however, their meaning will pass over our heads as easily as they passed over the heads of James and John. Let’s take care to hear these words aright and heed their call to reevaluate our assumptions about greatness, honor, leadership, and servanthood. • Why do you think the disciples struggled to much to grasp what Jesus told them about his coming death? • What is our attitude toward power and glory? How does this attitude mesh with Jesus’ call to discipleship? • How does Jesus’ call to service relate to our typical understandings of service? • What does it mean to be the “slave of all” (v. 44)? How does such a calling challenge our expectations of what it means to follow Jesus? In the OT and in the NT the terms ‘ebed and doulos were used for persons doing service for others in the home, on the land, or in government or business but not actually slaves, as well as for persons who were slaves. It is very difficult to know whether to translate “slave” or “servant” at many points in the biblical texts…. Persons doing service to others retained, or were intended to retain, dignity and relative autonomy as persons in their own right. They were not to be treated as property or to be abused in the home or elsewhere. Amos sharply attacked the man who, with his own father, abused a servant girl, thereby profaning God’s holiness (Amos 2:7). Persons in cultic service, too, were in position to place their laments before God, pleading their own cause; they were not simply to acquiesce in the divine service or accept without question whatever life brought them…. Walter Harrelson, “Servant,” Mercer Dictionary of the Bible, ed. Watson E. Mills et al. (Macon GA: Mercer University Press, 1990), 812. The motif of asking is developed in an interesting way in Mark. The disciples’ request, “we want you to do for us whatever we ask of you” (10:35), is the counterpart of Herod’s rash promise, “Ask me whatever you wish, and I will give it” (6:22). The disciples did not know what they were asking, and Herod did not know what he was promising. On the other hand, in the context of prayer, where trust and faithfulness are assumed, Jesus could say, “whatever you ask for in prayer, believe that you have received it, and it will be yours” (11:24). What James and John ask for are the places of honor in Jesus’ glory. “Glory” in Mark is always associated with the Parousia (8:38; 13:26), but commentators have debated whether these were thrones at the Parousia or places of honor at the messianic banquet. Lane raises the intriguing question, “were James and John asking for a confirmation that the places they occupied in the fellowship meals which the Twelve shared with Jesus would be their seats when his glory was openly unveiled?” According to John 13:23, the Beloved Disciple was reclining on Jesus’ right. Alternatively, according to Matthew 19:28 and Luke 22:28-30, Jesus promised the disciples that they would sit on twelve thrones, judging the twelve tribes of Israel. Thrones are part of the Old Testament imagery associated with the Son of Man (Dan 7:9) and the coming judgment (Ps 122:5)…. Among the Gentiles, those who are recognized as rulers exercise authority over them (10:42). The irony was that the disciples were imitating those whom they despised. Jesus could have said the same about the Jewish leaders (the Maccabees, the Hasmoneans, and the chief priests), but by pointing to the Gentiles he turned their attention to the Herods and the Romans. The construction “hoi dokountes archein” means “those who are recognized as rulers” rather than the more wooden sense, “those who seem to rule.” Compounding the irony, Paul uses the verb dokein in a similar fashion in Galatians 2:2, 6, 9 for Peter, James (Jesus’ brother), and John: “those who were supposed to be acknowledged leaders (what they were makes no difference to me).” The author of 1 Peter later admonishes the elders of the church, “do not lord it over those in your charge, but be examples to the flock” (1 Pet 5:3). Jesus’ reference to “their great ones” (hoi megaloi, 10:42) reminds the reader of Herod’s entertaining his “courtiers” (megistasin, 6:21). Maneuvering for the places of honor has no place in the kingdom. R. Alan Culpepper, Mark, Smyth & Helwys Bible Commentary (Macon GA: Smyth & Helwys, 2007), 345–46, 48–49.